If I find more resources I will add them here. May you have a blessed and fruitful Lent! 2019 Online Carmelite Retreat with St. Edith Stein. ICS Publications Weekly Video Podcast for Lent. “Join Br. John-Mary of Jesus Crucified, OCD and Br. Pier Giorgio of Christ the King, OCD as they talk about the theme of conversion and its place in Carmelite spirituality.” Subscribe on YouTube. ICS Publications 55% off sale for Lent 2019. This is a beautiful meditation from St. Bernard of Clairvaux that was in today’s Office of Readings in the Liturgy of the Hours (iBreviary). May it be a blessing to you as it was to me. The whole world awaits Mary’s reply. When I was a child my favorite movie was the The Sound of Music. I think being an only child, living with just my mother, made me appreciate a large, loving, two-parent family enormously. My favorite book, Cheaper By The Dozen, about a fun-loving family of twelve children, settles it. Maria Von Trapp, the mother of the large family in The Sound of Music, wrote her book of memoirs that the movie was based on, The Story of the Trapp Family Singers in 1946. Author of several books, she has an exuberant writing style that is natural, pulls you in, and makes you want to be right there in the action. Originally from Austria, the family who were a very talented folk singing group, fled during World War II to escape the Nazis and came to America in 1938. The family built, mostly on their own, a large home in rural Vermont, and a lodge for visitors to stay and hear their concerts. They toured the world singing, and some, including Maria, became Catholic missionaries to Papua New Guinea. They were always on the go and had seemingly endless energy. Once they decided on a project, whether it was a family singing tour, building a barn, clearing land, or creating a restaurant, they all pitched in and got it done in short order. In 1955, Maria published “Around the World With the Trapp Family.” She wrote about how their family lived their Catholic faith in Austria throughout the year. I’ve read a few of her books, but this has been long out of print. Sophia Institute Press, has now republished it, so this wonderful Catholic life can be enjoyed by everyone. My first impression upon receiving it was that this is one substantial book. Hardcover and beautifully printed, this book is meant to be kept for years, and meant to be used all through the year. The contents follow the liturgical year, explaining the seasons and why we celebrate them. Each feast day is lovingly explored with songs and music, recipes, and simple crafts, along with wonderful memories of Catholic family life in Austria before WWII. A separate section elaborates on how to celebrate each Sacrament within the family, anniversaries, birthdays and other special family moments, including how to handle sickness and death within the family. There is a definite focus on the spiritual life and the life beyond. I found the section on how they actually lived Sundays to be particularly significant in our culture that treats Sunday with no sense of the sacred. What is so lovely about this book is that Maria explains the faith and how to incorporate it into your family’s life so beautifully. It makes one long for a time past when faith was seamlessly woven into the tapestry of the community. We can, at least, weave it into our own family’s life now. It would be great to start the New Year with this book. Use Discount Code radio25 when ordering the book using this link: http://sophiainstitute.com/aroundtheyear. The Old Testament shows God’s love and plan of salvation for His people. It is filled with many, many prophesies of the Messiah – the Christ who will come into the world to save it. You may have heard some of these prophesies, but if you haven’t really been paying attention you may have missed the connection. These hundreds of prophesies are some of the proof that the Apostles, and evangelists after them, use to show that Jesus really IS the Christ. And if Jesus really, truly is the Messiah, what are you waiting for? Your life can be better, filled with love, peace, mercy, and the real joy that only God can give you. You just have to open your heart. Today is the Annunciation, the day we celebrate the Angel Gabriel appearing to Mary, Jesus’ mother, to ask her if she will be the mother of the Savior. The day God became a man, so that man can become like God. In honor of this, I thought I would start a special project I have been contemplating for some time: highlighting the Old Testament prophesies of Christ with the New Testament fulfillment of them. Over time you’ll be able to see that Jesus really is the Savior promised for thousands of years. I’m also adding a link to the Catechism for more information. And Mary said to the angel, “How shall this be, since I have no husband?” And the angel said to her, “The Holy Spirit will come upon you, and the power of the Most High will overshadow you; therefore the child to be born will be called holy, the Son of God. And behold, your kinswoman Elizabeth in her old age has also conceived a son; and this is the sixth month with her who was called barren. For with God nothing will be impossible.” And Mary said, “Behold, I am the handmaid of the Lord; let it be to me according to your word.” And the angel departed from her. *Some versions say “young woman.” The original Hebrew word “almah” means young, unmarried woman. The Greek translations used by the early Christians, used the word “parthenos,” which means virgin. Catechism of the Catholic Church Connection: Paragraphs 484-511. 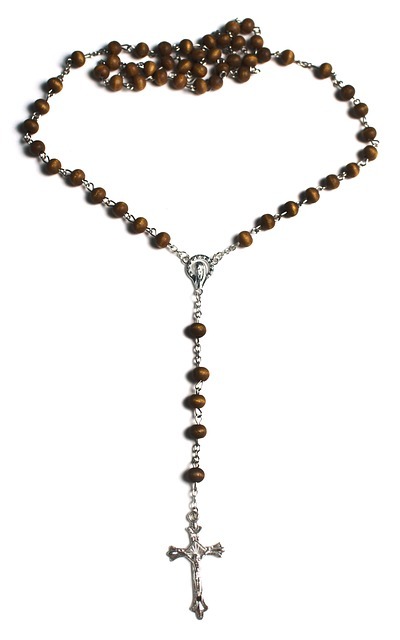 Do you find the Rosary hard to pray? Do you feel like you don’t get much out of it? Then you are doing it WRONG! I happened to stumble upon a great video recently by Fr. Daniel McCaffrey, a priest of the Archdiocese of Oklahoma City, that changed my entire view of the Rosary. Even though I’ve encountered some great books on Rosary, I find this video really demonstrates how to make your prayer fly. Essentially, the Rosary is a jumping off point for a deep dialog with Christ and His mother. Take the time to watch the whole thing to the end. I think you’ll be impressed. 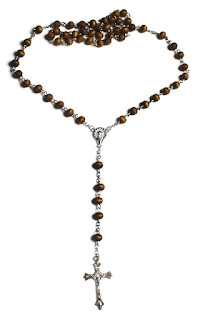 If you have been praying the Rosary for a long time you realize the blessings that come with it. It is a powerful aid to deepen your prayer life, and also a powerful weapon in spiritual warfare. Lately, I realized that there are a plethora of recently released books about the Rosary discussing both of these topics, and I thought I would share them with you. The wonderful Liturgy of the Hours and Mass readings app iBreviary, includes the hour called the Office of Readings. I love this part of the daily prayer because many times it includes readings from the Early Church Fathers. In preparation for Pentecost, one of the readings this week was from Saint Cyril of Jerusalem, bishop in the 300’s. I find it just stunning and thought I would share it with you on this Pentecost. The water that I shall give him will become in him a fountain of living water, welling up into eternal life. This is a new kind of water, a living, leaping water, welling up for those who are worthy. But why did Christ call the grace of the Spirit water? Because all things are dependent on water; plants and animals have their origin in water. Water comes down from heaven as rain, and although it is always the same in itself, it produces many different effects, one in the palm tree, another in the vine, and so on throughout the whole of creation. It does not come down, now as one thing, now as another, but while remaining essentially the same, it adapts itself to the needs of every creature that receives it. In the same way the Holy Spirit, whose nature is always the same, simple and indivisible, apportions grace to each man as he wills. Like a dry tree which puts forth shoots when watered, the soul bears the fruit of holiness when repentance has made it worthy of receiving the Holy Spirit. Although the Spirit never changes, the effects of this action, by the will of God and in the name of Christ, are both many and marvelous. As light strikes the eyes of a man who comes out of darkness into the sunshine and enables him to see clearly things he could not discern before, so light floods the soul of the man counted worthy of receiving the Holy Spirit and enables him to see things beyond the range of human vision, things hitherto undreamed of. This is the first of an occasional series of meditations. The crowds before Pilate wanted an earthly leader. One that would bring them power, glory & free them from the Romans. In the Old Testament (1st Samuel, Chapter 8) the people rejected God as their king. They wanted a king like the other countries had. Even though Samuel warned them the costs of a king: taxes, being servants to the king, etc., they still wanted someone to lead them into battle, someone they could look up to and lead them to glory. They rejected their Creator, who made the universe and everything in it; the God who rescued them from Egypt and gave them a land flowing with milk and honey. How could they have thought that an earthly leader could protect them better than the creator of everything? They did not trust God. They saw the Red Sea part, they saw the pillar of cloud and the pillar of fire lead and protect them as they escaped the servitude of Pharaoh, but they still did not trust. They wanted power, glory and freedom, but they didn’t understand that Jesus is the only one that will bring them true power, true glory, and true freedom – the freedom from sin. It is only because of our hardness of hearts that we don’t recognize how awful sin is – how it separates us from God. How sad God must be that His beloved people reject Him. Our culture today also does not want the sort of king that Jesus is. We continue to reject God in every part of our society. Our leaders reject Him. Our governments reject Him. Our courts reject Him. Our schools reject Him. Our families reject Him. Even some of our churches reject Him. We just recently celebrated the feast of Our Lady of Fatima, and will celebrate the 100th Anniversary of her apparitions to the children of Fatima, for most of this year. During the apparitions at Fatima, Portugal, our Blessed Mother, and the angel that preceded her, made it clear that many souls have lost faith and trust in God, and many will be lost. They don’t follow God or even acknowledge Him, they don’t believe in him, and therefore will not be saved. We need to pray for them. Our Lady told us we need to pray and sacrifice as reparation for the sins of the world. It is all our sins that cause the chaos in the world. It is our sins that cause war and famine. Learn the message of Fatima, pray the Rosary for peace around the world. And pray that the world will accept Jesus as their real King. “Our life too is a path full of tribulations and of God’s consolation. We have a life in time which we are now living, and another life outside time to which we are making our way. The time at our disposal is an important part of the inheritance God has left us. Time represents the separation between the present and that moment when we stand before God with our hands either empty or full. Only now in this life can we obtain merit for the next. In fact, each single day of ours is a period given us by God, so that we may fill it with love for him, with love for those around us, with work well done, with putting the virtues into practice; in a word, a life full of good works pleasing to God’s eyes. Now is the time to amass the treasure that never perishes. For each one of us it is the acceptable time. Behold now is the day of salvation. Once it is past there will be no other time. What Does The Word Believe Mean?